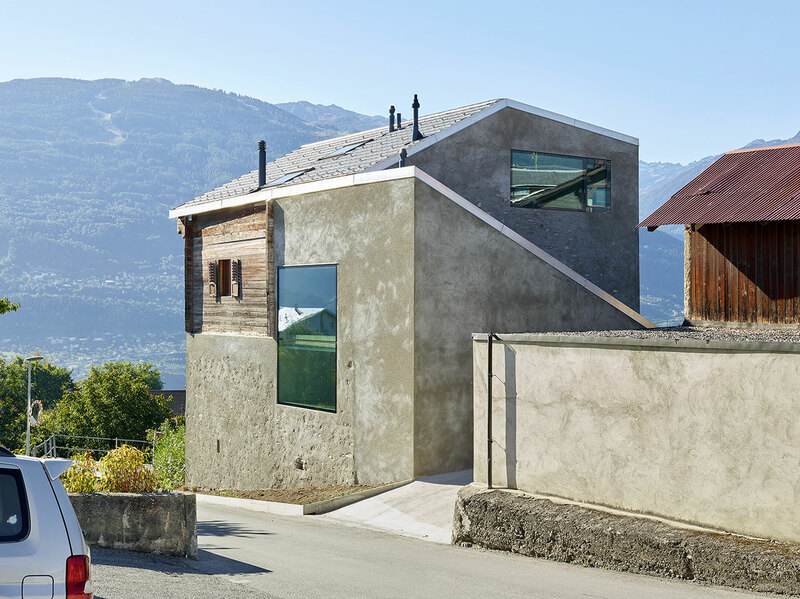 For the renovation of an old house in the small alpine village of Ormône in Valais, Switzerland, the architecture studio of Savioz Fabrizzi has maintained the building’s character by keeping all of its haphazard additions and expansions in place. Originally built in 1860, the house has a stone base that has been extended over the years with an additional floor in the form of a wooden structure on top of it, and a small room at the back. 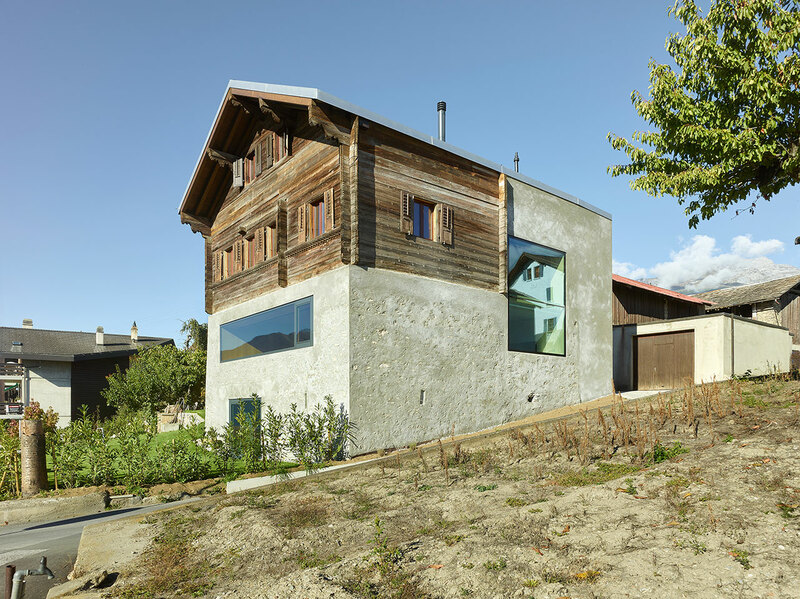 For this latest intervention, new walls had to be built and windows opened, thus adding another layer to the house’s history. Savioz Fabrizzi’s intervention unifies all of these elements by covering the exterior surfaces with a simple render, which has been removed in places to reveal the masonry beneath in the style of traditional "pietra rasa" plasterwork. 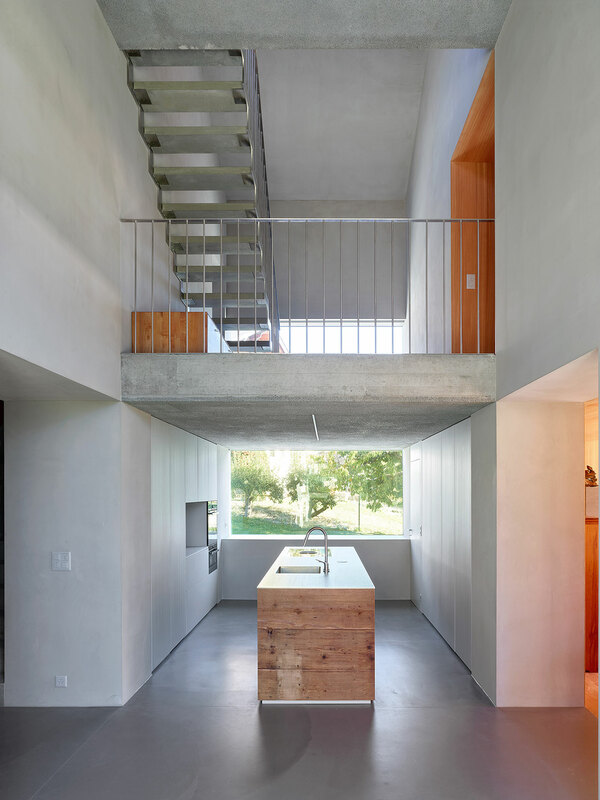 While appearing small to the eye from the outside, the Reynard/Rossi-Udry House is surprisingly spacious inside, with four bedrooms, a bright kitchen and a double-height dining area. 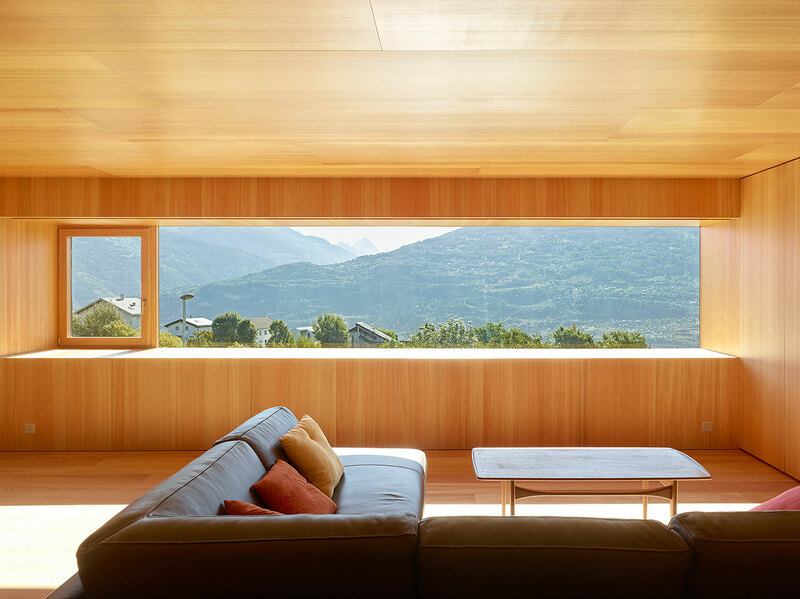 The living room, tucked under the original wooden structure, is completely covered in wooden panels, while a long window offers a beautifully framed view towards the mountains of Val d’Hérens to the south. 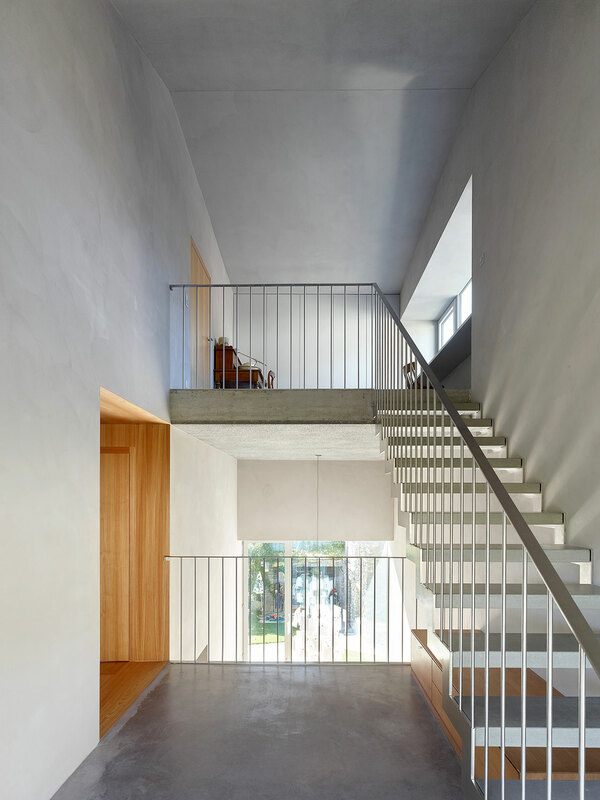 Two concrete slabs create different levels in the stairwell, allowing visual interaction between the occupants and separating the children’s bedrooms on the first floor from the master bedroom up in the attic. 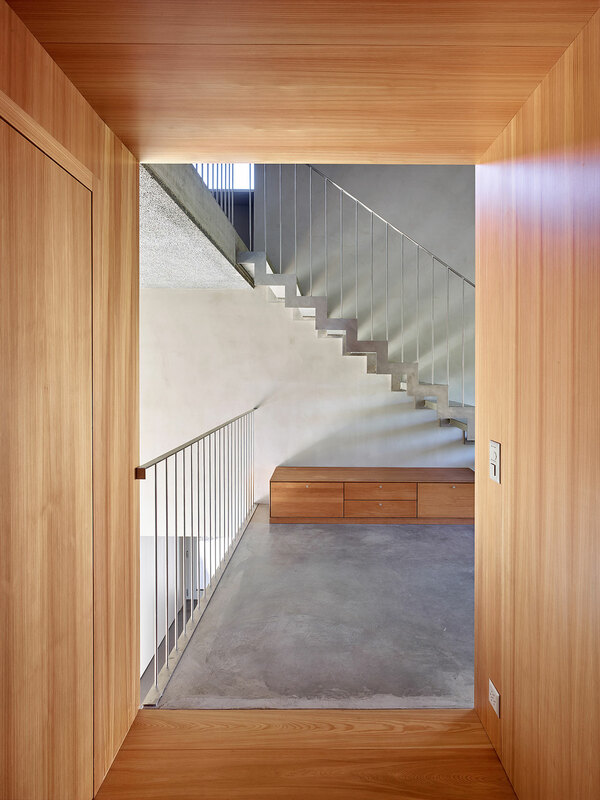 The interplay between metal and wood continues throughout the house, with uniform, grey surfaces created throughout using mineral coating on the walls and concrete for the floors. At the same time, wooden furniture adds warmth and contrast to the otherwise monochrome interior. 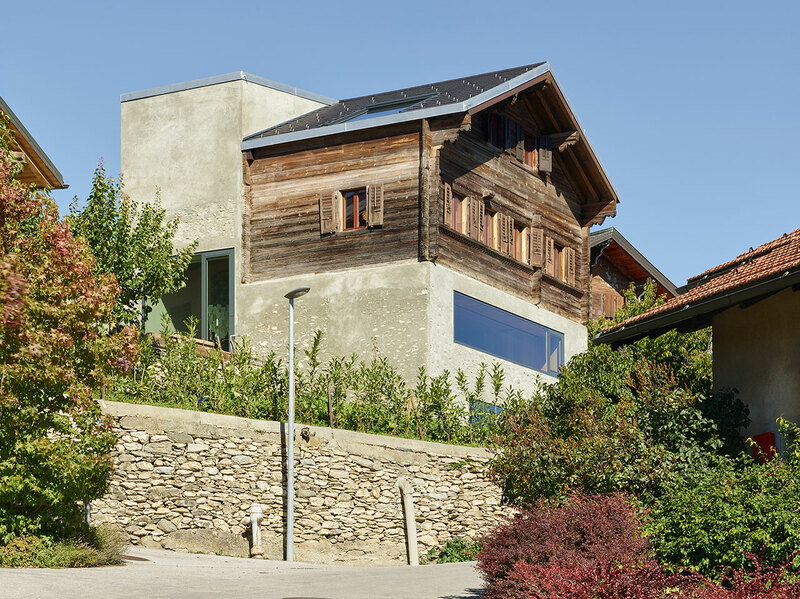 According to the architects, this “timeless contrast” between wood and metal was established when the house was first built, and so, by accentuating these materials, the design remains consistent with the building’s original character. 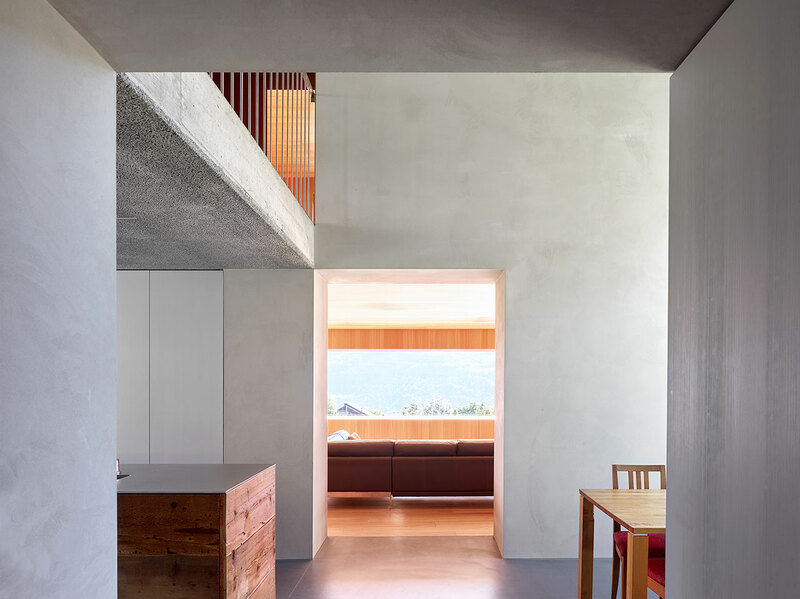 Generous openings in every room allow for ample sunlight to fill the interiors, and align the spaces with the beautiful alpine views and the garden outside. 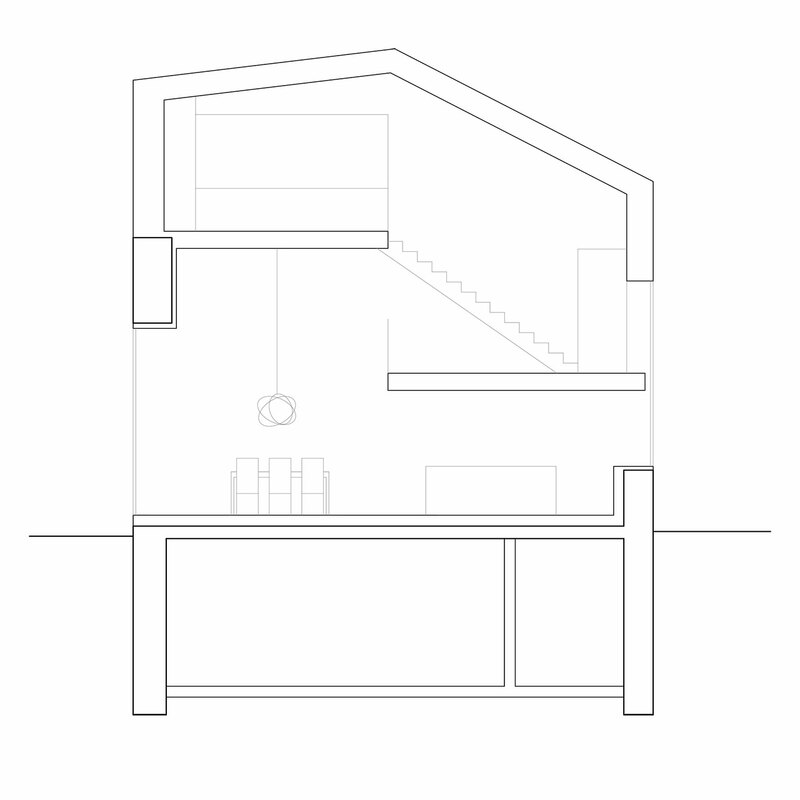 Favourite design touch: the simple desk nook on the top of the stairwell, which, with its full-length window looking out over the rooftops of Savièse to the north, offers a hidden corner in this otherwise very compact house. 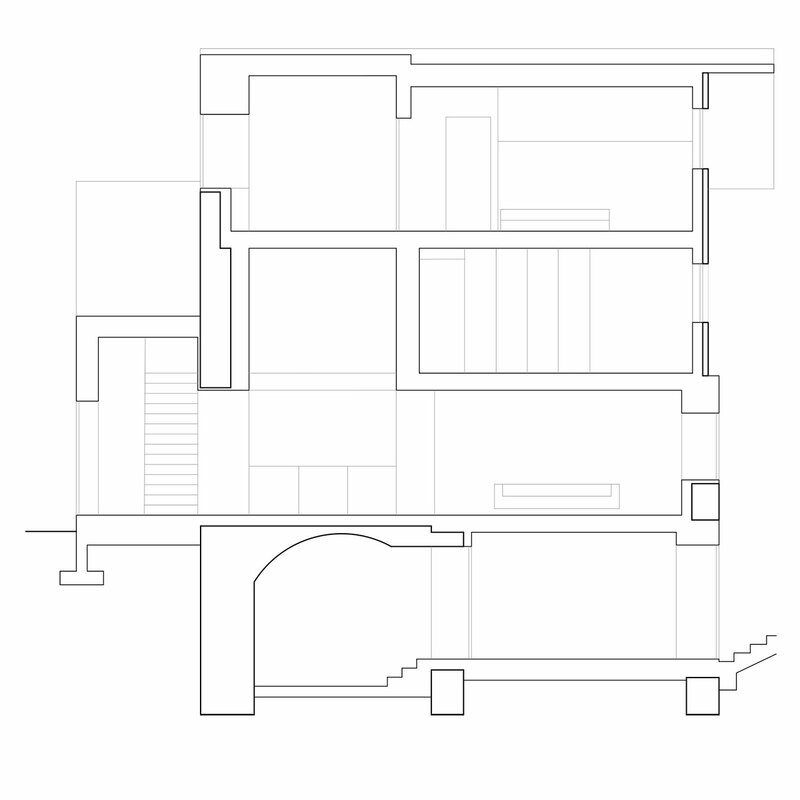 Section AA © Savioz Fabrizzi Architects. Section BB © Savioz Fabrizzi Architects. 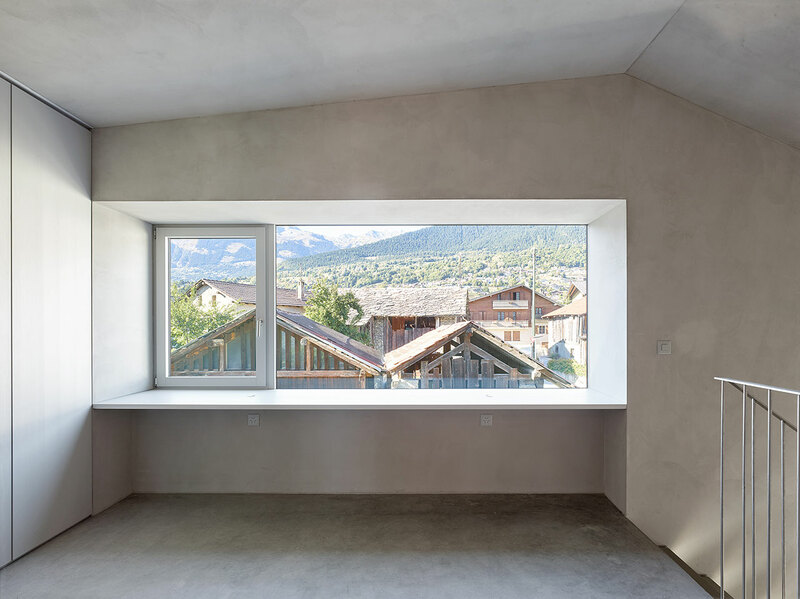 A long window in the living room offers a beautifully framed view towards the mountains of Val d’Hérens to the south.